If you are currently transitioning, then you know how difficult it can be to maintain two different textures. Detangling becomes a bit more challenging so when it comes to styling, you really want to keep it simple. Sticking to styles that are easy to do will decrease manipulation of the two textures and therefore lessen the chances of breakage and shedding. If you’ve had trouble styling or simply want to discover a few styles to implement in your transitioning regimen that are easy to achieve but also fabulous, we’ve got you covered! These styles will help blend your textures and get you through the week. Plus, we made it easy for you: all of these styles start with the letter B, just like Black Naps. (See what we did there?) As always, make the style your own and have fun with it! Braidouts are one of the easiest and simplest ways to blend your two textures and come out with a dope style. You can do multiple braids for a more defined look like NaturalNeiicey does in the video below, or just do two for a “big hair” result. Either way, make sure you rod the ends of your braids with flexi rods or perm rods. This will give your hair a curl so your style won’t have straight, scraggly ends. Fluff it up to add an extra boost of fabulousness! Some days you just won’t feel like dealing with your hair at all. Maybe you don’t have the time to spend on an intricate style, you just want something simple, or want to salvage a bad hair day. This is when buns come in! There are a million and three ways to do buns: they can be done on old hair, freshly washed hair, or with added extensions. You can make it fancy but a simple, classic bun like this throwback from SmartistaBeauty will never go out of style. It may seem like too much for transitioning hair to handle, but blowouts are actually a great way to stretch transitioning hair when done properly! They prepare the hair for virtually any style, including all of the styles mentioned in this post. Plus, when you begin with a blowout, you’ll be able to style hair that is pretty much all one pattern. Be sure to use a heat protectant and blow dry the hair cautiously, using a modified tension method that RenieceHairTV demonstrates. This method will keep your hair from drying out at the ends and also get your roots straight. (Video begins at 1:15). This is yet another great way to blend textures and come out with an incredible style. Bantu knots result in beautiful corkscrew curls that can be transformed into updos, frohawks, or other styles if you desire. When styling these, be sure to detangle properly like TiffanyNicholsDesign and not to install them too tightly. Take your time when unraveling in order to ensure a frizz-free style that is sure to impress. Long-term protective styling is a great alternative to daily/weekly styling when transitioning. Getting yourself a set of box braids will give you a much needed break when necessary or even keep you from doing the big chop if tempted. Moisturize them every 2-3 days to keep your scalp from becoming dry, and to preserve the style for 4-6 weeks. Upon takedown, remove any shed hair before washing and take your time with detangling to prevent breakage. You can install these yourself like JourneytoWaistLength or go to a trusted stylist. 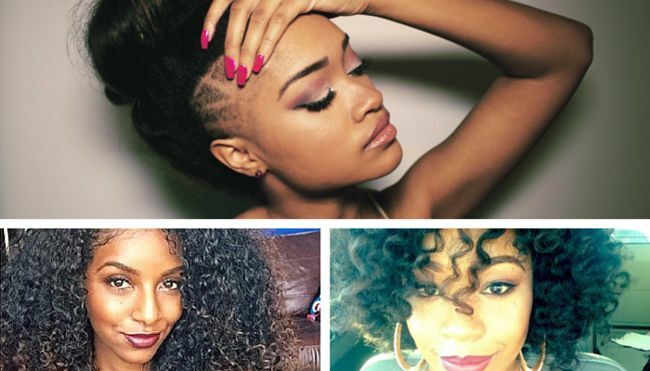 What's your favorite transitioning style? This article was written by Kanisha Parks for CurlyNikki.